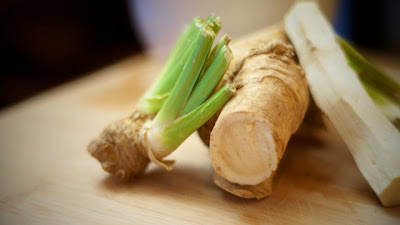 If you have the inkling for the hot, spicy flavor of horseradish and haven’t tried growing this root in your garden, I would highly recommend it. Horseradish is a perennial plant from the Brassicaceae family, which includes mustard, wasabi, broccoli and cabbages. It has numerous culinary and medicinal uses. Horseradish grows profusely, much like a weed that can actually become invasive. Not as aggressive as the mint family, I still recommend finding a strategic location where you can keep it at bay. You may think the handful of small roots you purchase from the seed company is initially pricey but it is similar to garlic. Buy it once and you can continue to cultivate and expand your crop as long as your heart desires. It is all in how you prep your soil. We planted ours in a former compost bin location. This root prefers growing in rich soil. A jar of this stuff, especially the gourmet types are a bit pricey. With the ease of growing your own, this root vegetable is a cinch for the novice gardener. It takes approximately three seasons to generate the hefty, fleshy roots needed to produce homemade horseradish sauce. Typical of a perennial addition to your garden, it is an initial investment of time to get it established, but it’s a long-termer.